The influence of various innate lymphocyte subsets in solid organ transplantation is still a matter of debate. 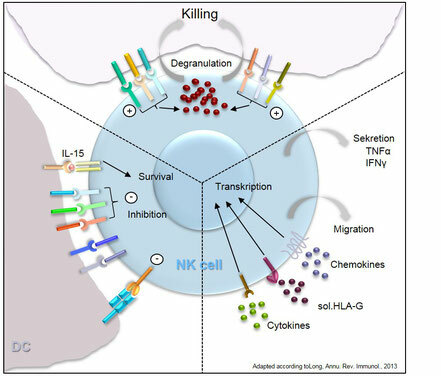 For instance, the influence of natural killer (NK) cells in SOT has mean meanwhile illustrated, although their exact role is still a matter of debate. Whereas authors report that NK cells are important for tolerance induction either by killing graft-derived antigen-presenting cells or by downregulating the homeostatic proliferation of CD8+ memory T cells other publications illustrate their involvement in allograft destruction and the development of chronic allograft vasculopathy. We focus on the various aspects of NK cells as well as their receptors for allograft survival in SOT in order to uncover the underlying mechanisms of the conflicting data.